This may have been the longest room revamp in history, but the day is here! My dining room is complete! You probably don’t even remember the plan I had for this room waaaaaay back when do you? There are lots of reasons it took so long. One, I didn’t have a solid vision. Sometimes knowing exactly the way you want a room to look takes time. As I found certain pieces that I fell in love with like that amazeballz chandelier, my vision became more and more clear. So it dragged on and on, but I think it is always better to take your time so you end up with exactly what you want. Let’s be real. Even budget friendly design decisions cost money. And we don’t have money to go wasting around here. Two, I’m sorta busy being a mom. It is an everyday thing. And as much as I could spend forever doing my creative thing, I am fully aware that they aren’t going to be little forever. So having unfinished projects is just sorta part of the deal. And third, I had to get some help from the ol’ hubs for some of the projects that made this room happen. His schedule is a bit funky, so when we do have a day to spend as a family, DIY is not always at the top of our list. How is that for keepin’ it real? An avid DIYer telling you that DIY isn’t always her favorite thing to do. Yep, I said it. Ok. So take a look at that before photo! Did I just hear you start snoring? Probably because that is the most boring room one has ever seen right? So now look right! Ta-daaaaa! I seriously wish you could actually stand in this room. The photos just don’t give you the full awesome that it really is. Like I mentioned in the original plan post, I wanted a dining room that felt more casual, was way more interesting, and had a bit more of a collected feel. How do you think I did? 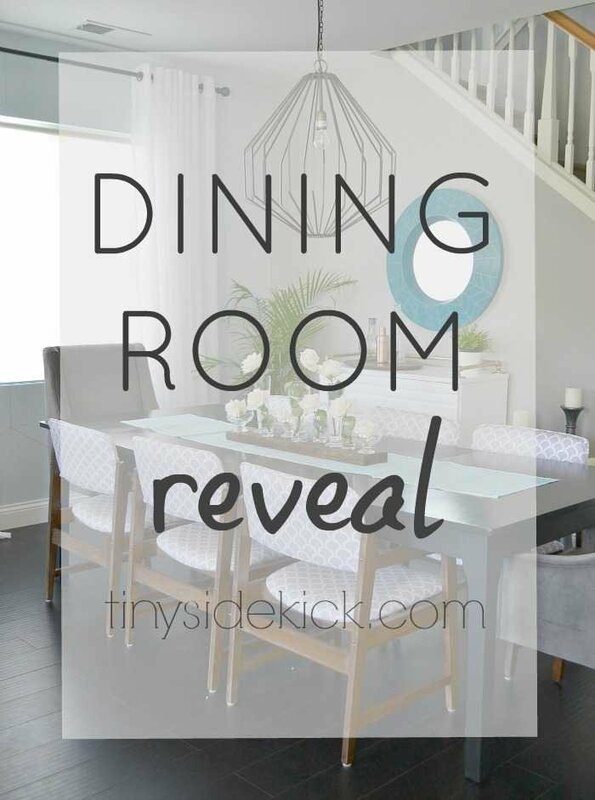 Let’s take a closer look and try to get a better feel and I’ll tell you all about the projects, big and small that went into turning this room around. 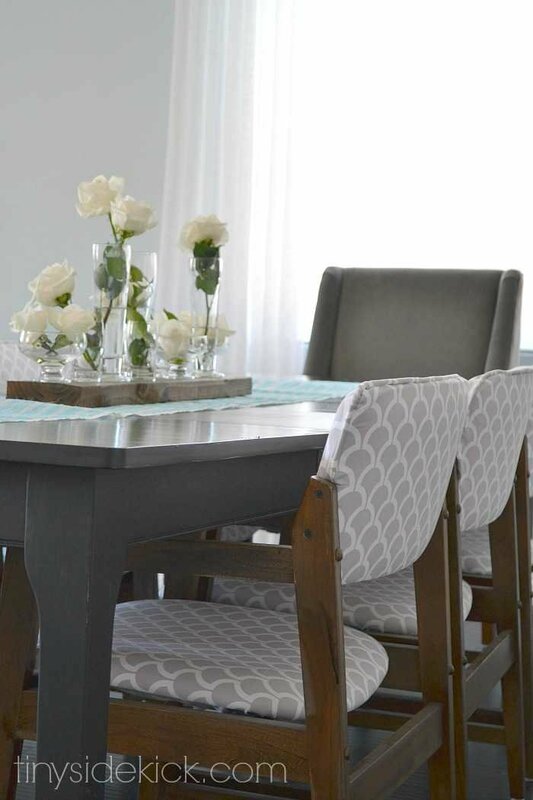 If you’d like to see just how I taught myself to reupholster these chairs, I shared the step by step process in this how to reupholster dining chairs post. Then, for the end chairs I wanted them to go, but not match, and I found these ones on sale at World Market. They’re really comfortable. Once those two things were done, the dining room stalled for quite some time. Product Sources: reupholstered dining chairs (how-to), Union Pendant (no-longer available), round mirror, bar cabinet. Then I was flipping through the Crate & Barrel catalog one day and spotted a beauty of a chandelier. (find similar ones here) I still had gift cards from my wedding, so I made the purchase. This was definitely the splurge for the room, but this room needed a statement, and this chandelier did that. Plus, I reinvented my the old sad chandelier into a perfect Outdoor Candle Chandelier! The next project was this old cabinet that was my grandmother’s, that I turned into an industrial chic bar cabinet. It gives us some much needed storage and is such a great way to remember my grandmother. It has some really fun details on the inside, so if you have not yet seen its transformation, go take a peek! So then the small silver candle holders on the wall below the stairs weren’t doing it for me anymore either. (Sorta like if you give a mouse a cookie right? Snowball effect!) But I had an ugly mirror that I had also inherited from my grandma that I was able to make beautiful! 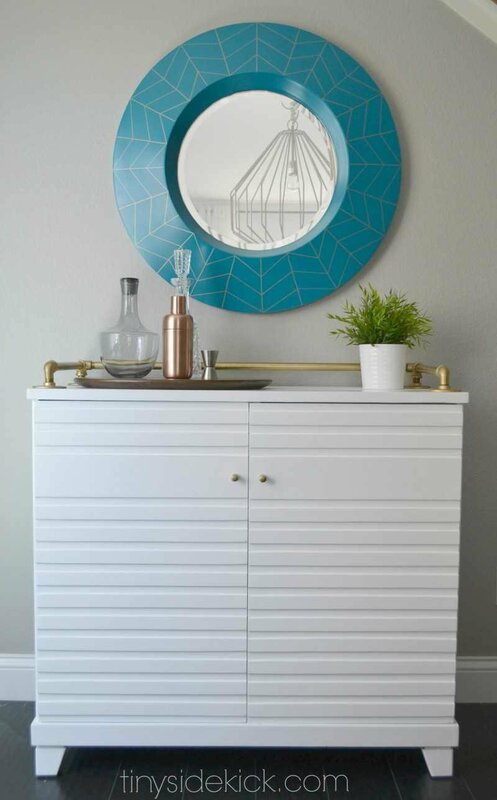 The herringbone pattern on the mirror is my favorite thing in this room! So I did what any other resourceful lady like myself would do and I created a new leaf! Well actually I had some help, but the point is, I was able to make the table 12 inches longer for only about $40. Now it not only is way more comfortable for 8 people (and I could squeeze a few kiddos in there too if I need to,) but it fills the room better as well! Hooray me! So now when you enter my home, you see this pretty space! So here we are. This room is not boring, it has the more “collected over time” feel that I was going for, and the only new purchases I had to make to get this look were the chandelier and the end chairs! Not bad huh? Is there a room in your home that’s taking forever to finish? What’s stopping you? The budget, time, or vision? Let me know in the comments below! So beautiful, calm, and inviting. Will you tell me what shade of blue you used to paint the wall? Thank you Sara. All of my paint colors are listed in this post. I really do love that light blue. It is blue without looking like baby blue. 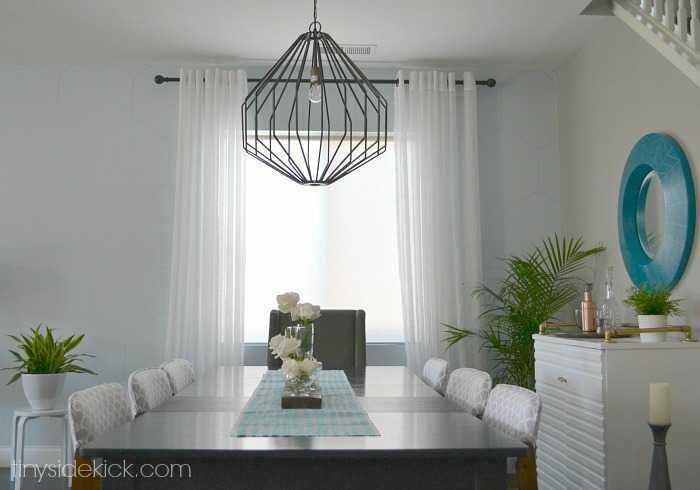 Love that Crate and Barrel chandelier! Do you remember the name of it? Hi Shay. It was called the Union Pendant Light. I don’t think they have it anymore, but that may help your google search! I found your blog via Pinterest and I am SO impressed! I followed every link for your projects for this room. It looks amazing! It was also exciting for me because I have chairs almost exactly like yours and I am planning to recover them, so your tutorial will be super helpful. Thank you so much for sharing. Amazing! So beautiful! You are soooo talented!! And alright this is totally a blogger observation but you must have contorted yourself to capture shot #8 eh?! You have me laughing picturing myself contorted to get that shot. Actually my stairs go up right there so I was on the stairs with my camera between the spindles. Would have been more fun to tell you I was swinging from the chandelier! Thanks for your lovely comment! And you just reminded me that I need to post the table extension. I used to be so organized! What happened? You really have a gift! It may have taken a while to finish, but it was well worth the time! Thanks for sharing! Love how this turned out, Corey! You have such a talent for creating spaces that look awesome on a budget! This post will be one of my features at the next Frugal Crafty Home Blog Hop! Thanks so much for your kind words Carrie! This room almost defeated me, and I’m so glad I won! Hahaha! Wow – such a fabulous transformation. 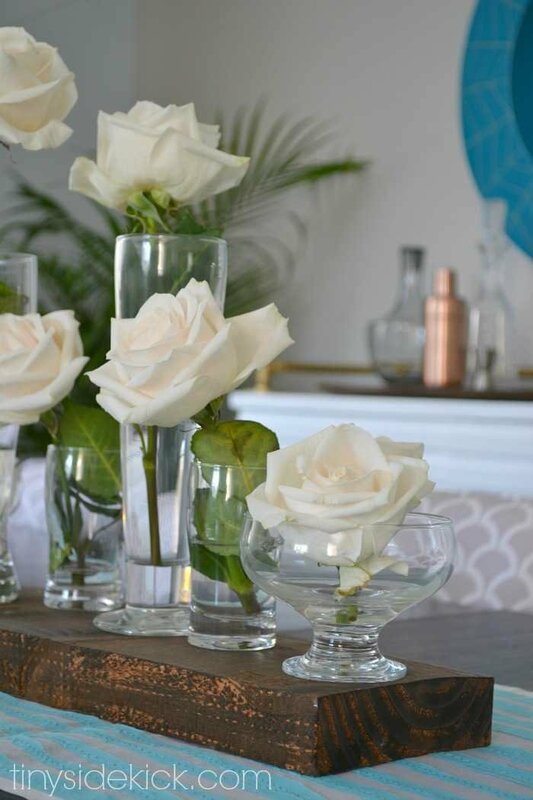 I love all the DIY projects you did for this space- the bar cart, chairs, and mirror…all stunners! It feels so updated and unique- great job Corey!! 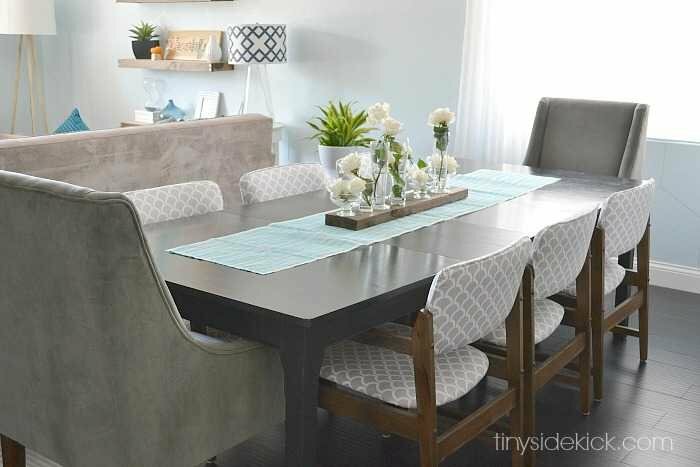 Love your dinning room! 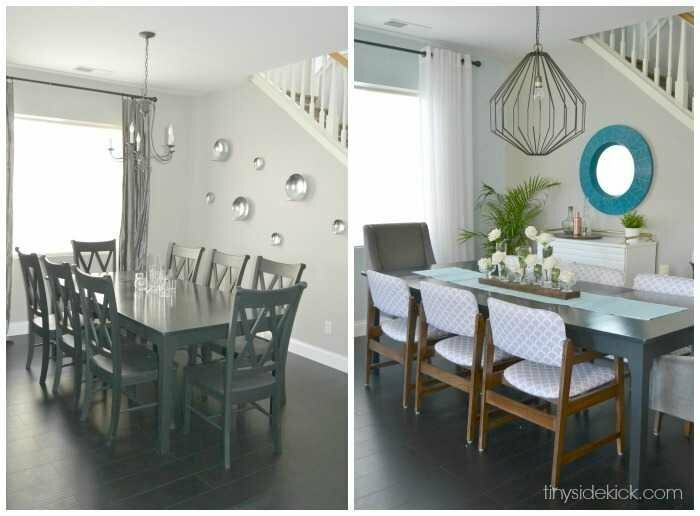 Love the chairs and the lighting fixture! Thank you Sherry! I’m so glad it is finally done and ready for a season of family dinners 🙂 Hope you have a great week. Such a gorgeous makeover Corey! It turned out beautifully! Thank you Sarah. It was a never ending revamp, but so worth the wait. Hope you are doing well! I love it!! The colors, patterns, different styles of furniture. Perfection. Oh my! I love it!!! Looks SO inviting yet perfectly styled! We would love for you to share Monday at Your Designs This Time! 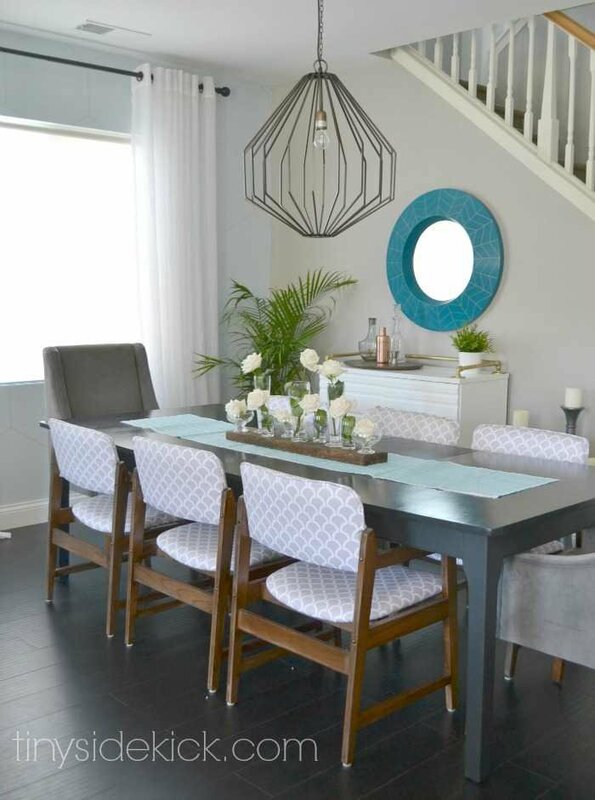 Can I come for lunch and enjoy this gorgeous room with you?Fabulous job, Corey!Pinning! Oh I so wish you could!!! That would be so much fun! You nailed it! The room definitely looks collected and more interesting. Beautiful! Love the chandelier and the refinished chairs. Would love to see a pulled out view of the layout sometime! absolutely fabulous!! I love every detail. You did an awesome job!!! What a wonderful space!! I love how much personality comes through and you got some excellent pictures there, too!! Thanks Amy. I struggled with the photos on this post. This room has really odd lighting so I appreciate your kind words. It’s just amazing, Corey! I love those chairs so freaking much… and the wall and the mirror! Whew… all kinds of awesomeness. Uh. I started my office makeover in February… in the home stretch, but that means months more, probably. No, I’m going to get this sucker done, yo. Thanks Gwen. I know what you mean. Start to finish can take so long, but in the end so worth the wait. I saw your wall treatment. Ah-maze-ballz! I’m in love with your LIGHT! So. Good. … also, I totally have that fabric pinned as well. I lurve it, and it’s great to actually see it used in a project. Great work!! Thanks Jen! The light is definitely the cherry on top! I love,love,love it all. You did a great job. That chandelier is to die for. Like, my papers are getting all wet because I’m drooling. I totally agree that the whole room has the perfect collected over time feel now! hahaha! When I first read that, I thought something else. Glad it was just drool! It looks great! Loved all your projects too! You go girl! Gorgeous dining room! I love the chandelier and your centerpiece arrangement is so simple and romantic. You did an awesome job! I’m pinning. It’s gorgeous, Corey! I love that chandelier. It definitely looks like a worthy splurge. You did an amazing job reupholstering those chairs too! Corey this is such a beautiful space! Who cares how long it took you, it was well worth the wait 🙂 And I am OBSESSED with that chandelier. Great purchase! I just LOVE everything about it Corey! That chandelier … OHemgee!!! SO fun! Love the pops of colour and the eclectic mix of styles! It’s all perfect Corey!!! 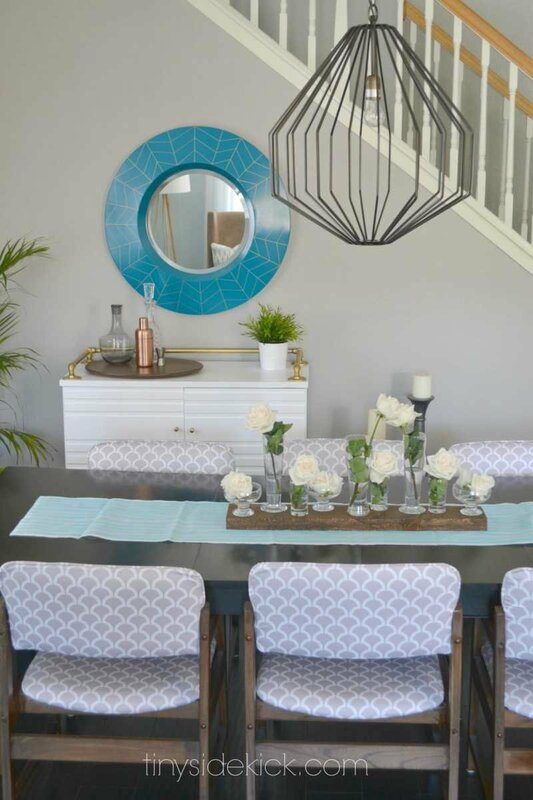 Corey, this looks beautiful and I love seeing all of your DIY projects come together in this room. It’s so pretty and personal and one of a kind. LOVE! Hello Corey, what a fun transformation from boring to wow! I love the color palette you have picked and the makeover you gave to your cabinet. 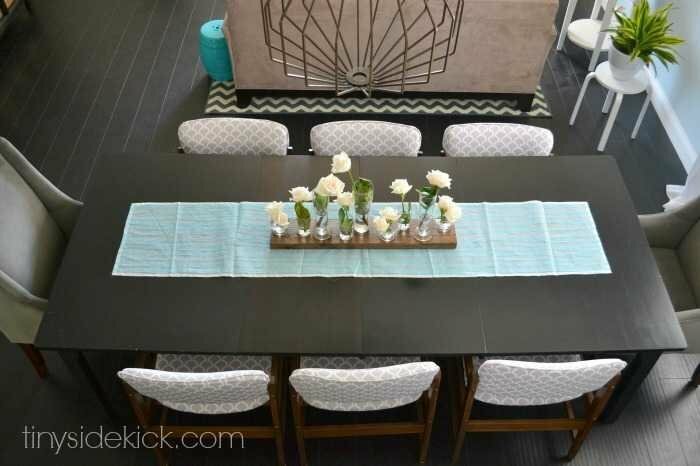 My favorite is how you styled the table. I love the different flower containers, it gives interest to the feature. Very successful make-over!